Character Analysis: Devised for actors, directors and others wishing to learn and then explore in-depth the technique developed initially by Rudolf Laban and his assistant William Carpenter, and later completed by Yat Malmgren and taught by Christopher Fettes, founders of Drama Centre, London. Having further developed the teaching in collaboration with Christopher Fettes and others during the last seven years, Giles Foreman is now a leading contemporary exponent in the UK and across Europe. He leads the workshops along with expert colleagues. 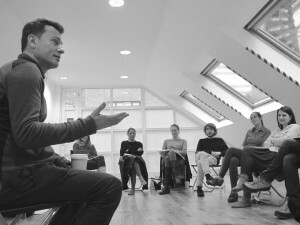 The workshops involve the progressive unfolding of the constituent parts of the technique, followed by opportunities to embody what has been covered through practical exploration and in acting exercises. Yat Malmgren recognised that this would prove to be a powerful tool for the actor and went on to complete Laban’s theory. He extended Laban’s ideas by creating a psychological typology which brings together Laban and Stanislavsky. Inner motivation and outer expression leading to the detailed and accurate construction of character. This work was placed at the heart of Yat’s original acting studio in London and later at the Drama Centre London. The technique is familiar to all the students of Yat including Sean Connery, Anthony Hopkins, Colin Firth, Helen McRory, Tom Hardy, Michael Fassbender, Simon Callow and all the many accomplished artists taught over the course of 50 years work. January 2017: Swedish Radio podcast SPOTLIGHT – about Yat Malmgren, and the work. Including recordings made in 2000 with him and with Christopher Fettes at Drama Centre, plus commentary from Simon Callow and Pierce Brosnan. The book A PEOPLED LABYRINTH written by Christopher Fettes is in stock; available for visitors to our studio in London, and from major bookshops including French’s Theatre bookshop, and via Amazon. With GILES FOREMAN and colleagues. ADVANCED CHARACTER ANALYSIS: Summer school, 10 – 6 pm. Intensive practice-week (Intensive practice-week for those who have completed the 4 stages). £100 deposit to reserve a place, instalments possible*. Here is a Part-time STUDENT REGISTRATION form to complete, if you’d like to join us. 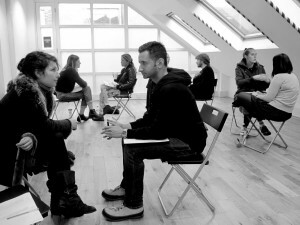 “I found the Giles Foreman workshop illuminating and inspiring. Very challenging at times, but always great fun. Despite having gone to drama school, it was the first time I was given a thorough, incisive insight into the inner and outer workings of the human personality. No longer a case of intuitive guessing and trial by error – work on a character became a reliable and exact breakdown of the innumerable aspects that apply to each and every one of us: how we sense, think, intuit and feel; how the emphases and combinations of these ‘mental factors’ affect what type of person we are, and the way we tick and relate to the world and the people around us; how all this is coloured by each character’s specific, individual background, and how our outward expression is a direct reflection of our inner state. 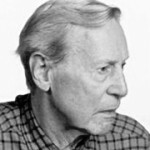 Yat Malmgren [pictured] was one of the great solo artists of European modern dance and later became a legend in British actor training, having been the creator of the Laban-Malmgren System of Character Analysis. Yat Malmgren (March 28 1916-June 6 2002) led, jointly with John Blatchley, the creation of the Drama Centre in the autumn of 1963 and stayed as Director of Movement at the School. Malmgren taught a number of famous actors including Sean Connery, Pierce Brosnan, Colin Firth, and Anthony Hopkins, as well as Andrew Tiernan, Helen McCrory, Paul Bettany, Michael Fassbender, Russell Brand, Anne-Marie Duff, Craig Kelly, John Sim, Sean Harris, Ryan Early, Andrew Pleavin and Nicolas Tennant. Born in Gavle, north of Stockholm in 1916, he went to went to drama school with Ingrid Bergman but possessed an exceptional talent for movement and dance, and soon became a world famous “Character Dancer” of the 1930’s. As the war broke out Yat found refuge in Dartington Hall in Devon where he met Hungarian character Dancer Rudolf Laban. Laban took Yat under his wing, and left him all his notations on the exploration of movement in everyday experience. Yat later adapted Laban’s notations to acting and thus created a revolutionary teaching tool as opposed to conventional theatrical dance. Yat initially taught at a small studio in West Street, off Shaftesbury Avenue in London, and became the acting guru of Sean Connery. He was invited by Lawrence Olivier to work at the fledgling National Theatre and later taught a young Anthony Hopkins at the Royal Academy. He went on to found the Drama Centre, London which was created around his work and which has subsequently produced some of the greatest names in British and world theatre and cinema.